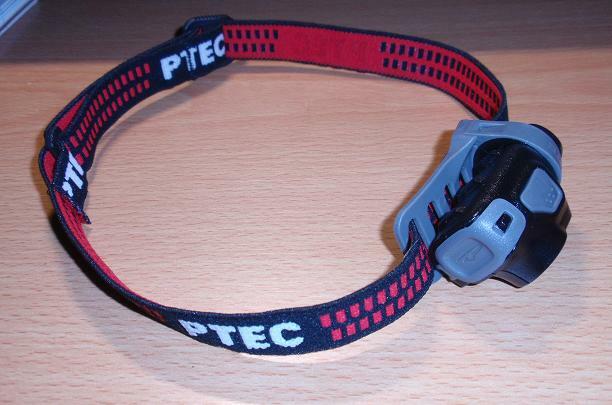 The Princeton Tec Byte headlamp is a LED headlamp. It uses 2 AAA batteries. Other LED headlamps I have used have 3 AAA batteries. The 2 batteries of the Byte make it a little smaller and lighter which is a good improvement. The Byte has two LED bulbs - a dim red bulb and a brighter white bulb. The red bulb is good if I want a dim light that maximizes battery life and minimizes desensitizing my eyes if I want to be able to see without the light. The white bulb provides more light for better visibility. 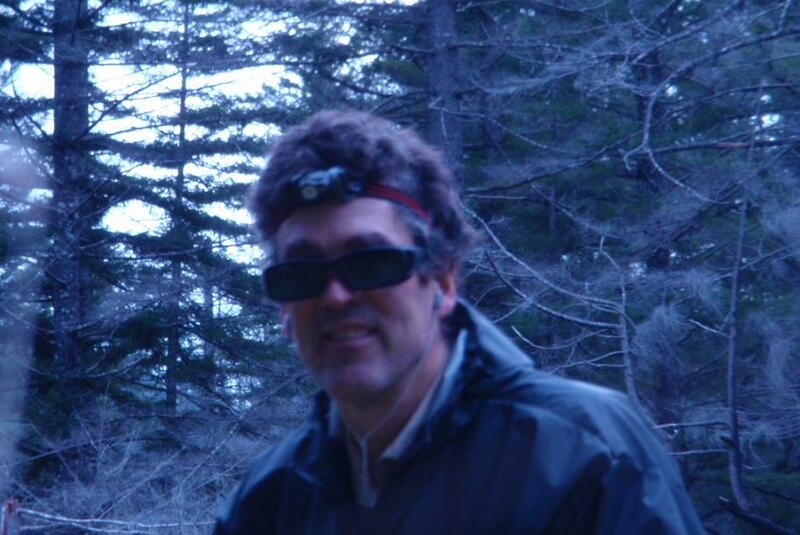 The lamp rotates so I can see better at long distance for trail walking, or I can see better at close distances. The lamp rotates easier than other LED headlamps I have used, which has been a criticism of mine. There is a pushbutton to turn the light on and switch between modes. Push the button and the red LED comes on. It didn't make any difference whether I tapped the button as quickly as possible or held it down for a number of seconds. Push it again and the white LED comes on in a low intensity. Push it again and the white LED goes to high intensity. Push it again and the light goes off. Other LED headlamps I have used also have a flashing mode, but I have never found that useful. The pushbutton operates easily. 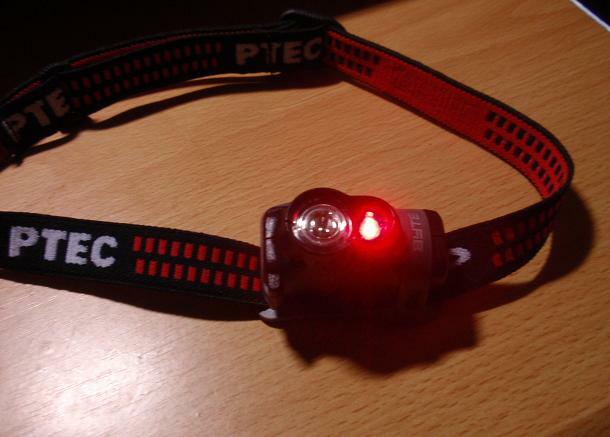 On other LED headlamps I have used, it is difficult to push the button hard enough. My testing will determine if the pushbutton operates too easily and comes on when it's in my pack. The button is a rounded rectangular shape with one corner cut off. At the top are 5 little bumps. To push the button, I have to push right where the 5 bumps are. Pushing at other places on the button didn't do anything. Mostly this is a "so what", except a number of times I pushed the button without effect, until I figured out where on the button to push. Another criticism of mine about other LED headlamps, is that when I first push the button, it goes to high intensity, but since I normally use low intensity, it would be better if it went to low intensity first to reduce the number of times I have to push the button. The Princeton Tec Byte attempts to fix this problem (if they even knew there was a problem to fix) except, that with other LED headlamps, if I leave the light on for a while, and then push the button again, it turns off. With the Byte, it always goes through the same sequence - red, low, high, off,... regardless of how long I wait between steps, so it doesn't really matter that it starts with the dimmest mode, which I assume I'll use most, I have to push the button a total of four times to turn the light on, then off. This is minor and many people won't even notice. Also, since the pushbutton is easy to actuate, it matters even less. The battery compartment door opens easily. Other LED headlamps I have used have difficult to open doors. My testing will determine if the door opens too easily - when I don't want it to open. The headlamp is black and gray plastic. 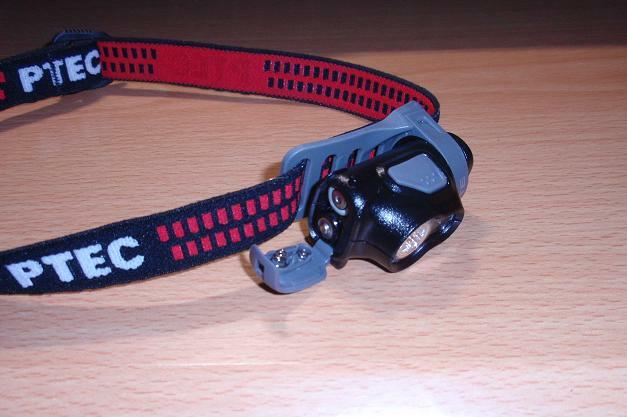 The headlamp head strap is elastic - black, white, and red. The head strap is long enough to go around my head with enough extra length so I could adjust it looser if desired. 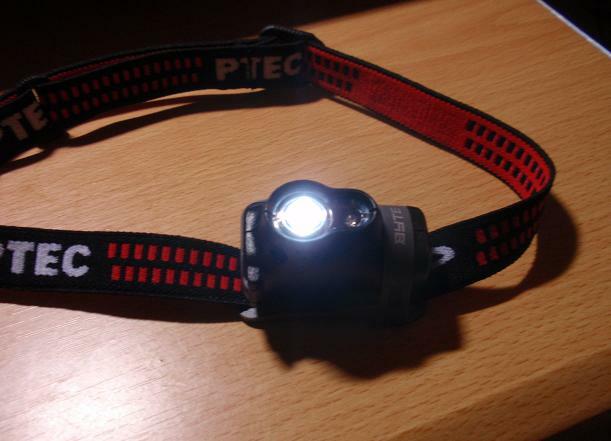 Another LED headlamp I have used had a strap that was just barely long enough. The Byte is advertised to be able to use Lithium batteries. I have noticed that some other LED headlamps warn not to do this because the slightly higher voltage might hurt the unit. Lithium batteries last about twice as long and weigh a little less. The Byte came with standard alkaline batteries which I will use for the test, but I normally use Lithiums. I'll briefly try the Byte with Lithiums to verify it works and see if there's any difference in the light. It uses 2 AAA batteries rather than the typical 3 so it's a little smaller and lighter. It rotates easily for hiking or looking at things close to me. The battery door opens easily. The head strap is long enough but not too long. There is a 6.5 x 10 inch (17 x 25 cm) instruction sheet in several languages which did a good job of explaining how to use the headlamp. The packaging material was difficult to open. That minimizes the chance of someone tampering with it, but maximizes the chance of damaging the headlamp. Not a big deal though. I used it enough to verify operation - so far so good. 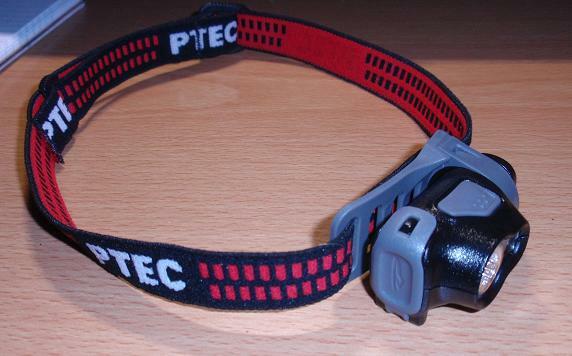 This looks like a great LED headlamp that fixes a number of minor problems I have had with other units. Look forward to my Field Report in about two months. Thank you Princeton Tec and backpackgeartest.org for letting me test this. November 12 to 17 - 3 night backpack and 2 night car camp on Deschutes River. 33 miles (53 km), 32 to 60 F (0 to 16 C). I used the light about 4 hours on red and 4 hours on low intensity white. Then the light went into this weird mode where it had very low intensity white and wouldn't respond to the switch. Emailed Princeton Tec who recommended I replace batteries which I did. December 2 - used light for about 2 hours with new batteries - same problem - light went into low intensity white and wouldn't respond to the button. I emailed Princeton Tec - no response. December 21 - tried one more set of batteries with printed expiration date of 2012 and measured 1.6 Volts to start so I knew they were good. I turned it on high for one hour, then the same problem - faint white light and wouldn't respond to the switch. Next day it worked again, tried it for one hour on medium, worked fine. Jan 5 - I called Princeton Tec. They said burn time spec was only if the switch wasn't pressed so I did a burn time test without touching switch. This light did not meet my expectations because of the burn time. The manufacturer's listed burn time is 80 hours on high and 96 hours on low. The usable burn time I experienced is 1 hour on high and 4 hours on low. After this, if I pushed the switch the light went into this weird mode where it had a faint white light and wouldn't respond to the switch anymore. The only way to get it to turn off was to remove the batteries. I talked to Princeton Tec customer service and they said the specified burn time was if the light was left on without ever touching the switch. The way I use a light is to turn it on to low for about 2 hours per night. I would expect to use it for many nights before the batteries died. Leaving the light on without turning it off isn't very useful. I tested the Byte in the manner Princeton Tec described. I just left the light on high without touching the switch. After 8 hours it was still bright enough to walk on a trail. After 24 hours it was much dimmer, but still usable around camp. After 48 hours it was very dim - if I held something at arm's length I could see it. Those brightness levels are subjective - "your mileage may vary". After 56 hours it turned off completely. I expected that when they say 80 hour burn time, they mean that after 80 hours it will still be at some level of brightness which is quite faint. In my test, right at 56 hours just before it turned off, maybe it was at that light level. 56 hours is 70% of the specified 80 hours. Maybe my set of batteries weren't the best, so I'll give them the benefit of the doubt on the 80 hour spec. One more thing about the burn time: other LED headlamps I have used had a burn time on high of about 50 hours, but that was with 3 AAA batteries. Since the Byte has only 2 AAA batteries, if it had a burn time of 33 hours on high I would be happy. The usable burn time for the Byte is 1 hour on high which is nowhere close. In the test without pushing the switch, after 33 hours the Byte was still barely bright enough to use it around camp. If the Byte didn't have the problem with not being able to use the switch, it would be pretty good. The high intensity brightness was enough to do some nighttime trail walking. The low intensity brightness was plenty to use around camp. The red LED was bright enough to see things that I held up at arm's length. The battery door never came open in my pack. The light switch was never accidentally turned on in my pack. In the limited amount of time I used it, the light was comfortable around my head, the head easily rotated, and the switch easily pushed. The main thing about the Byte was the limited practical burn time - 1 hour on high or 4 hours on low. After that if I pushed the switch, the light quit working. If I didn't touch the switch, the burn time was about 33 hours at a level bright enough to use around camp, which is about what I'd expect with just 2 AAA batteries. Aside from that, the Byte worked fine - easy to push switch, easy to rotate head, easy to replace batteries, and comfortable headband. A minor defect is that there's no marking on what polarity to put the batteries in, but I just marked a "+" with a pen on the right side to fix that. Too bad the Byte has that switch problem. Otherwise the 2 AAA batteries results in a little bit lower weight which would make this the light I use all the time. For the long term test, I'll try it one more time with a set of new batteries. I'll carefully see how long I can use it on low before it has the switch problem. Look forward to my long term report in about two months. Thanks to Princeton Tec and Backpackgeartest.org for letting me test this. January 18 - 4 night backpack on Illinois River in Southwest Oregon. 22 miles (35 km). 34 to 55 F (1 to 13 C). Used low white mode for 8 hours. January 24 - Turned on light for the last time on this set of batteries and let it burn until it died to determine burn time. For 4 hours I could use the light normally, turning it on and off at will. For another 4 hours I could turn the light on, but when I turned it off it went into the weird failure mode and I had to remove the batteries to turn it off. If I let it sit overnight I could turn it on again. Then I just left the light on. It was bright enough for another 40 hours that I could use it around camp - fairly bright 10 feet away. For another 14 hours it was bright enough I could see at arm's length but very faint further away. For another 24 hours it was so faint as to be un-usable in my opinion. Then it turned off completely. Burn time summary - 48 hours if you define burn time as visible 10 feet away, 62 hours if you define burn time as visible at arm's length, or 86 hours if you define burn time as very faint. Manufacturers specified burn time is 96 hours. It's too bad the Byte has this problem that it can't be turned off. It would be a pretty good light otherwise. It took 4 hours on low intensity white or 1 hour on high intensity white before it went into this mode that when I pushed the switch to turn it off, it had a very faint white light and wouldn't further respond to the switch - I had to remove the batteries to turn it off. Then, if I let the batteries rest overnight, it would turn back on and I could run it an additional 4 hours on low or 1 hour on high. Beyond that, I just left the light on and got a burn time of about 2/3 of the specified burn time of 80 hours on high or 96 hours on low. It was very faint but still barely usable at the end. Of course, this isn't real useful if you can't turn the light off and back on. Another thing is to compare the Byte with its 2 AAA batteries, with the ubiquitous 3 AAA LED headlamps, which have a burn time in the range of 120 to 200 hours on low, in my experience. I would hope that the 2 AAA Byte would be 2/3 of that - 80 to 133 hours. I got 62 hours burn time until it was still usable at arm's length. The Byte is somewhat less than I would hope for. Lightweight because it has only 2 AAA batteries. The light feels comfortable around my head. The head and headband are very stylish. I will not be using this light again. Thanks to Princetontec and backpackgeartest.org for letting me test this.